Opening night 6pm - 8pm Thursday 21st Jan. 2016 by Mary Brown. 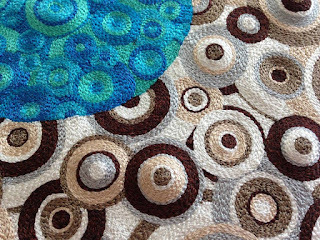 Sydney based textile artist Cathy Jack Coupland demonstrates her mastery of colour in her first solo exhibition at Timeless Textiles Gallery in Newcastle. 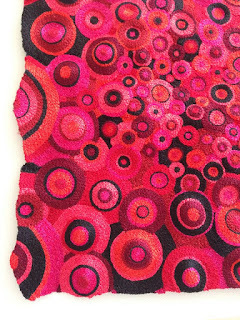 The works in the Colour: Cathy Jack Coupland exhibition range from bold use of bright, solid colours to the subtlest interweaving of contrasting-coloured threads. Cathy’s works are entirely covered with thousands upon thousands of stitches. These beautiful works are all free-machine-embroidered, a technique also referred to as ‘thread painting’. The resulting surface shimmers and undulates with a life all their own.